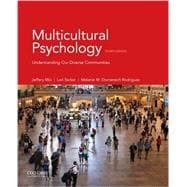 Multicultural Psychology: Understanding our Diverse Communities, Fourth Edition, combines quantitative and qualitative research with anecdotal material to examine multicultural issues and capture the richness of diverse cultures. The text is organized by topics in multicultural psychology rather than by ethnic groups, smoothly integrating important findings across ethnic groups as relevant. The text uses first-person narrative accounts from people of all ages and cultures in order to illustrate compelling topics such as communication, racial and cultural identity, development, racism, differences in worldviews, and immigration. Other issues covered in the text include gender, sexuality, age, and ability. Jeffery S. Mio is Professor in the Psychology and Sociology Department at California State Polytechnic University Pomona. Lori A. Barker is Professor in the Psychology and Sociology Department at California State Polytechnic University Pomona. Melanie M. Domenech Rodríguez is Professor of Psychology at Utah State University. Chapter 1 What Is Multicultural Psychology? Why Do We Need the Field of Multicultural Psychology? The Response to Hurricane Katrina: A Case of Covert, Unintentional Racism? Eating Disorders: An American Culture-Bound Syndrome?